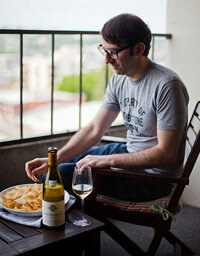 If you love Muscadet as much as I do, here’s a wine to hoard. Or purchase and share, whatevs. It’s California Melon. The former being the state (duh) and the later being the name of the grape. As an enormous Muscadet fan, I was a quite curious about how the grape would work in California. Not only was my inquisitive nature rewarded, but so were my taste buds. Super-delicious. The Lieu Dit compares favorably to any top wine from Muscadet I’ve had. And, taking a look at the bottle, it certainly fills me with #LabelLust. No doubt you and I can use our immense deductive powers of reasoning to figure this is a wine tailor-made for oysters. I actually enjoyed it with potato and spinach pierogis. Which would probably look pretty cool on a label, too. But not as evocative as an oyster in its shell. So what’s it like on the inside? Well this is a wine with an initial bracing quality that chills out into a more textured savory delight. 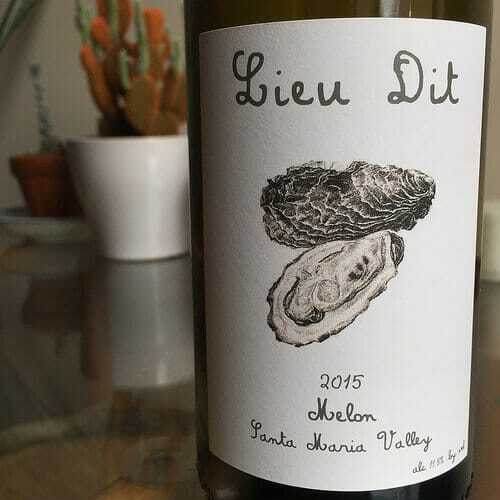 It’s certainly great on it’s own, seafood and shellfish an obv match, and you could probably get away with pairing the Lieu Dit with lighter chicken and pork preparations. Or chug it with a steak, who cares? It’s your life and your wine to do with as you please. The best line of the piece: “Or chug it with a steak, who cares? It’s your life and your wine to do with as you please.” We tend to forget that at times…. Agree! Quite pleased with how that sentiment came out. Appreciate the kudos. Received this bottle as a gift and am very pleased with it! Thank you for such a delicious treat! Keep up the excellent work! Glad you enjoyed the bottle. You definitely know some wine geeks! Thank you for the kudos and reading.